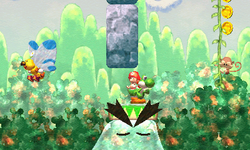 Ride the Blarggwich is the special level of World 3 found in Yoshi's New Island. Yoshi starts the level in a forest with a Blarggwich nearby which he has to ride while avoiding obstacles that are in his way. Yoshi can also use an Arrow Cloud to find a secret area with coins along the way. Eventually, Yoshi reaches the Goal Ring.